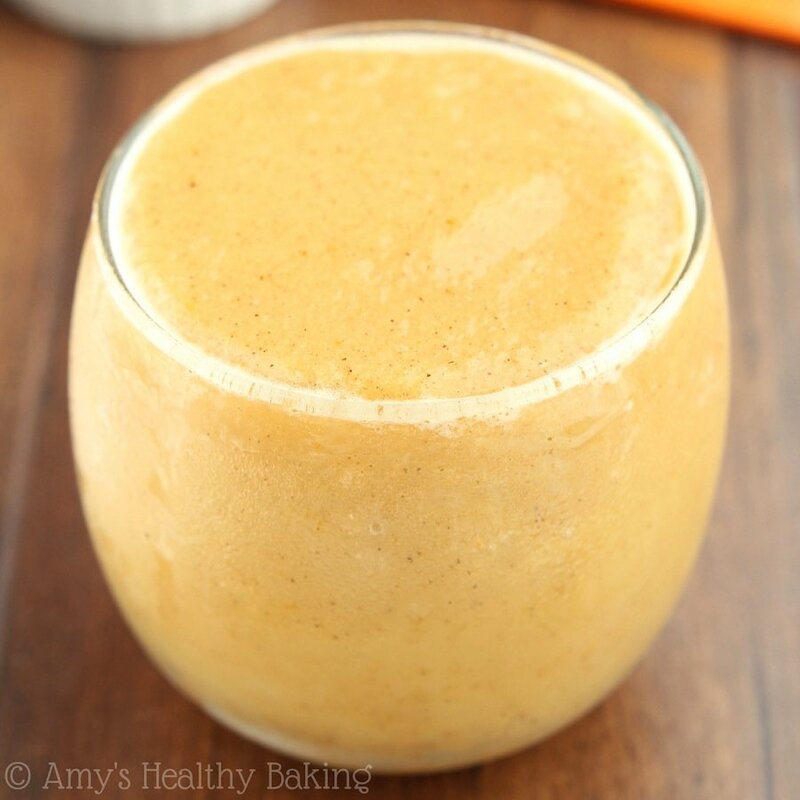 A light & refreshing smoothie that tastes exactly like the Thanksgiving dessert! 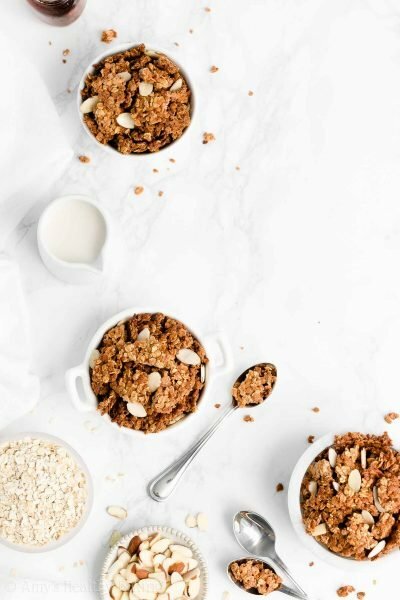 Healthy, skinny & completely clean-eating—but you’d never guess by the taste! After hauling all of our furniture and hundreds of heavy boxes into our storage unit, my guy and I said good-bye to our tiny place and turned in the house keys to the rental agency. Because he immediately had to fly out for a business trip—and apartment hunting is no fun alone—I drove south to visit my parents for a few days until he returned. Once I lugged 17 more boxes of baking ingredients, cake pans, and photography equipment into my childhood bedroom (food bloggers never stop working! ), I collapsed onto the soft mattress and slept soundly until morning. When I awoke, my legs ached for a run, so I pulled on shorts, laced up my shoes, and headed out the front door… Where a crisp and chilly overcast morning greeted me. Nothing like the blazing hot 105° weather 80 miles north in our town! After rubbing my palms together to get blood flowing into my fingertips again, I took off down the street, constantly thinking about baking fall pumpkin-y treats while I pounded my way around half the town. But by the time I spotted my parents’ driveway over an hour later, the sun had started peeking out between the clouds. 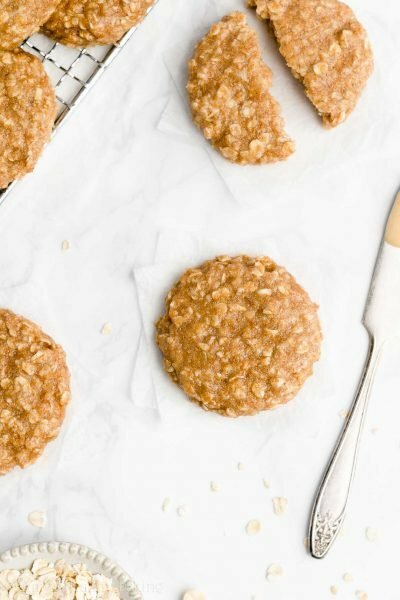 After I showered and snacked on a banana, warm summery weather had completely replaced the fall fog… And suddenly pumpkin muffins and cookies stopped sounding so appealing. 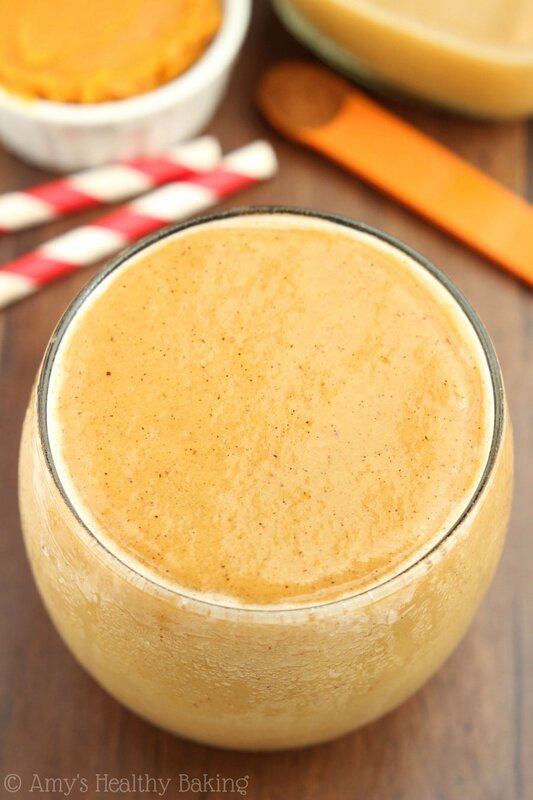 A Skinny Pumpkin Pie Smoothie! 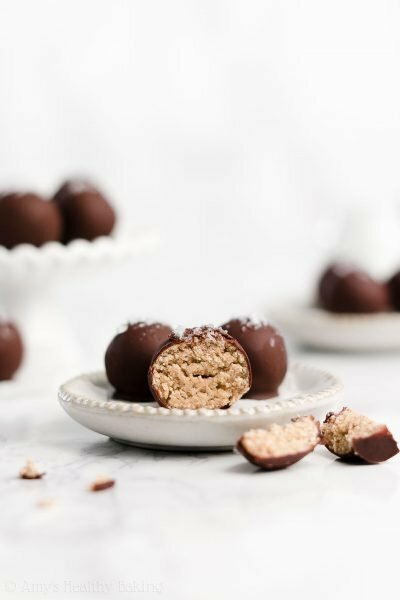 Full of spices and sweet fall flavor, it literally tastes like the traditional Thanksgiving dessert in a glass. 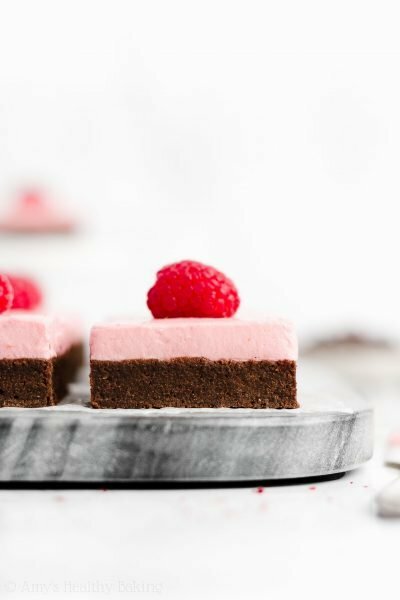 But with its cold and creamy texture, it’s much more refreshing than that heavy slice of pie! 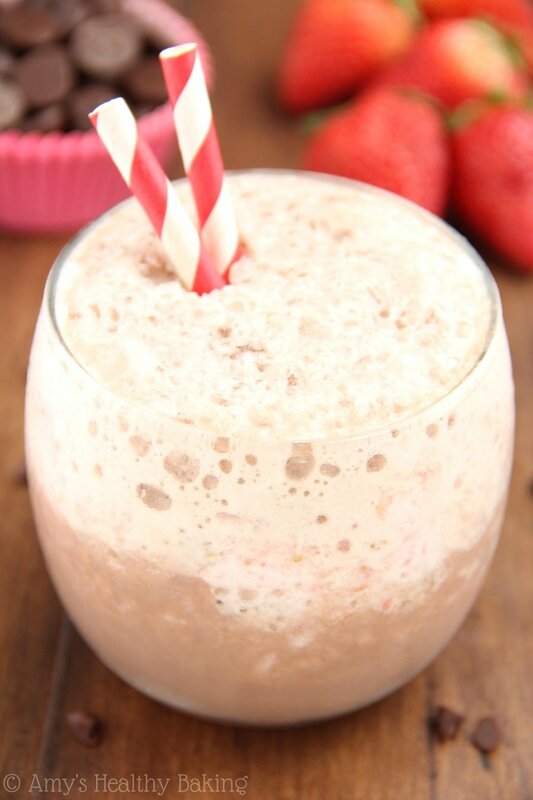 Made with just a few simple ingredients, this low-calorie smoothie is gluten free, vegan, and clean-eating too—the perfect guilt-free drink! 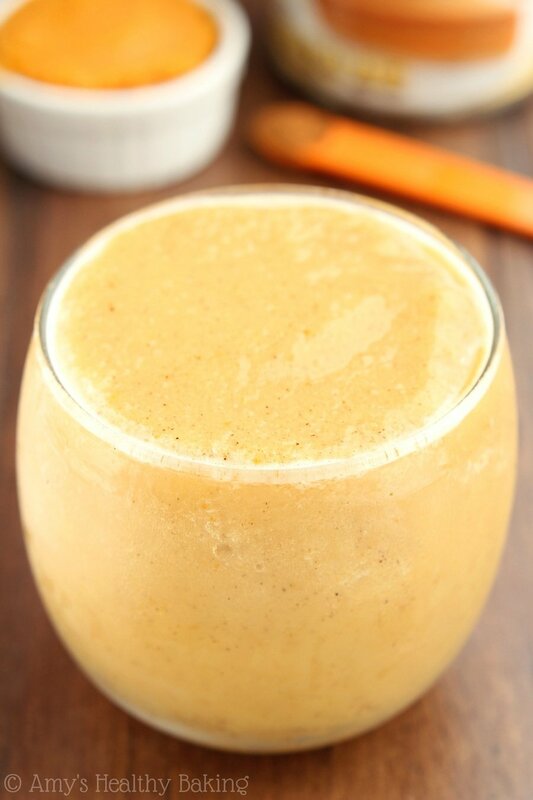 This easy smoothie starts with my favorite canned vegetable: pumpkin. 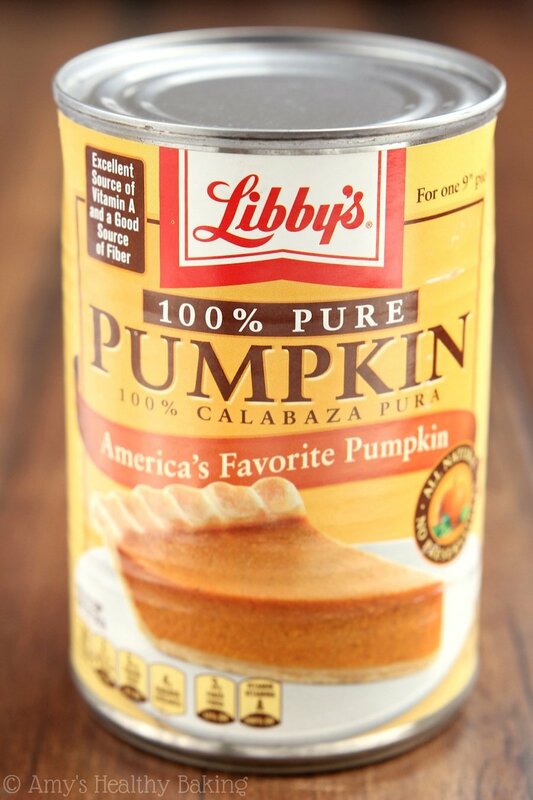 We want the regular pumpkin purée, not the pie filling. The pie filling contains spices and lots of added sugar. Although it’s an easy shortcut when strapped for time on Thanksgiving, it’s not what we want for these healthy smoothies! By using regular pumpkin purée, you get to decide how much sweetener and spice you add! 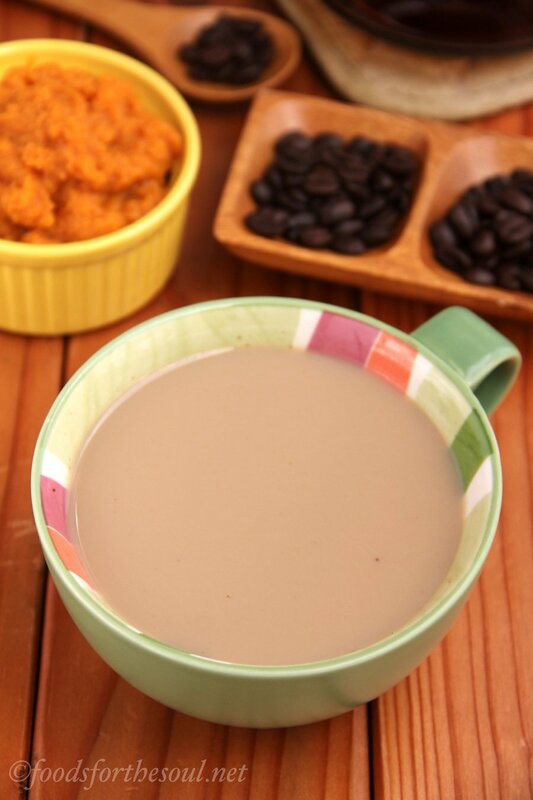 I like to mix the pumpkin, milk, Truvia, and spices together in a bowl before pouring it into the blender. Some days I’m on a huge cinnamon kick; others, not so much. 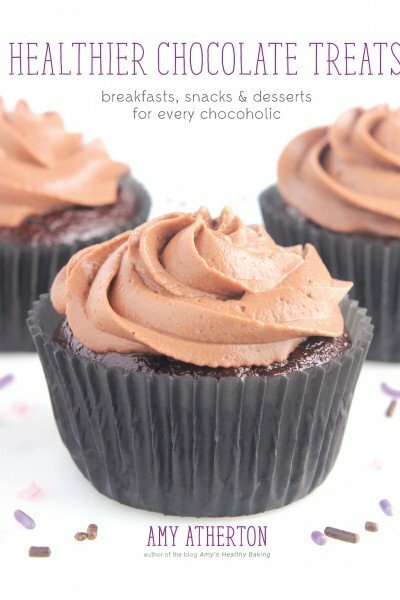 Taste as you go, and remember… The ice will dilute the spices, so it’s better to err on the side of just barely too much! Once you find the perfect balance, just add that mixture to the blender along with the ice, and pulse until it’s smooth. My parents own a blender from the Stone Age, so I looked like a clown making mine, constantly bending down to peer at the base where the blades were hidden and stopped it every 15 seconds to move around the ice with one of my 13 spatulas. 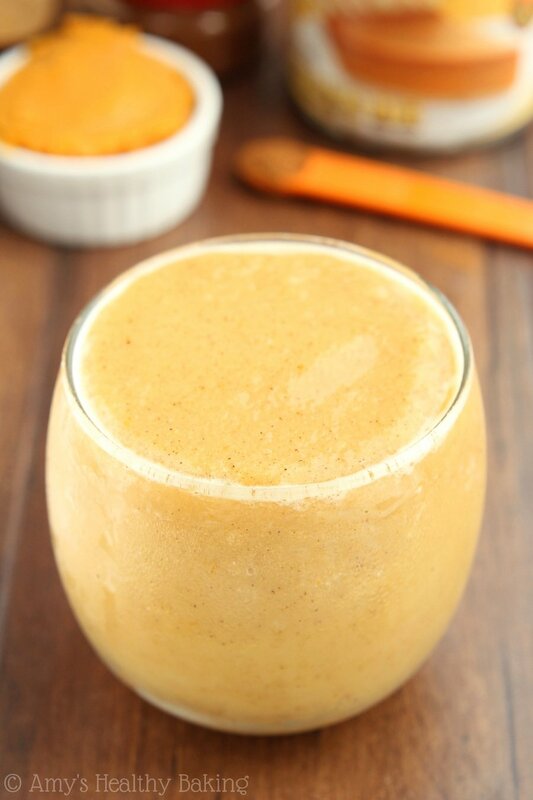 But when I eventually finished, I offered my mom a taste of this Skinny Pumpkin Pie Smoothie. As soon as she swallowed, she exclaimed, “This is SO good!! 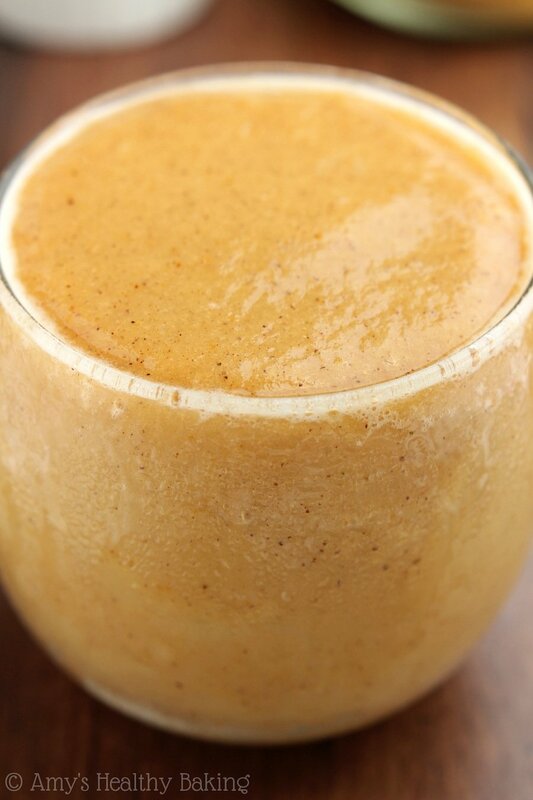 It literally tastes like pumpkin pie!” before polishing off half of the smoothie. 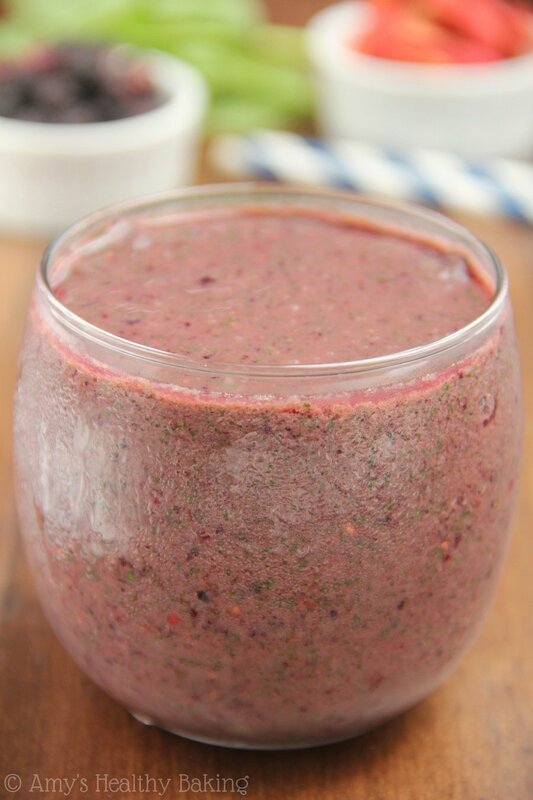 This refreshing smoothie tastes exactly like the traditional Thanksgiving dessert! Feel free to adjust the amount of spice to suit your tastes. 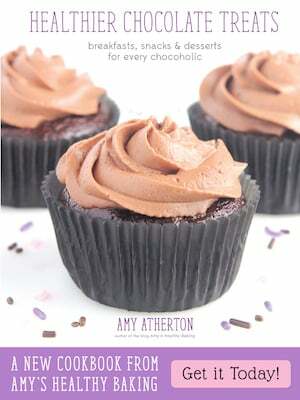 The recipe is easily doubled to serve more! Add everything except the ice to a blender, and pulse until combined. Add the ice, and blend until smooth. Serve immediately. Notes: Any milk (1%, 2%, whole, almond, rice, etc.) may be used. Substitute your favorite sweetener in place of the Truvia. If not using a no-calorie sweetener, the Nutrition Information may change. Hi,mom and I have now made your pumpkin pie smoothie five times and and we both absolutely love drinking your smoothie.I bought three cans of pumpkin puree so that we can continue to make your pumpkin pie smoothie,and sometime on Friday I am going to make your Oreo and pumpkin parfaits,at this time of the year just before Halloween we can’t get enough of pumpkin puree desserts,especially when they are sugar free or low sugar and healthy. Hi,I just made your pumpkin pie smoothie for the sixth time and I am drinking it as I am typing this note to you,and I love your smoothie and I enjoy making it as often as I can.unfortunately I only one can of the pumpkin puree left in the pantry and on November 1st mom or my brother will cup the top of the pumpkin so that I can scoop out the seeds and put them in the oven after I wash them and dry the seeds a little bit. I love and enjoy eating pumpkin seeds. Amy,what do you do with your pumpkins and the seeds after Halloween is over tomorrow night in San Fransisco? YAY!! Six times already?? Wow — I’m so honored Kim!! 🙂 That’s wonderful that your mom and brother will help you get the seeds out of your pumpkin! I haven’t yet decided what I’m doing with mine. Happy Halloween! ?? Oh my goodness!! That’s FANTASTIC! 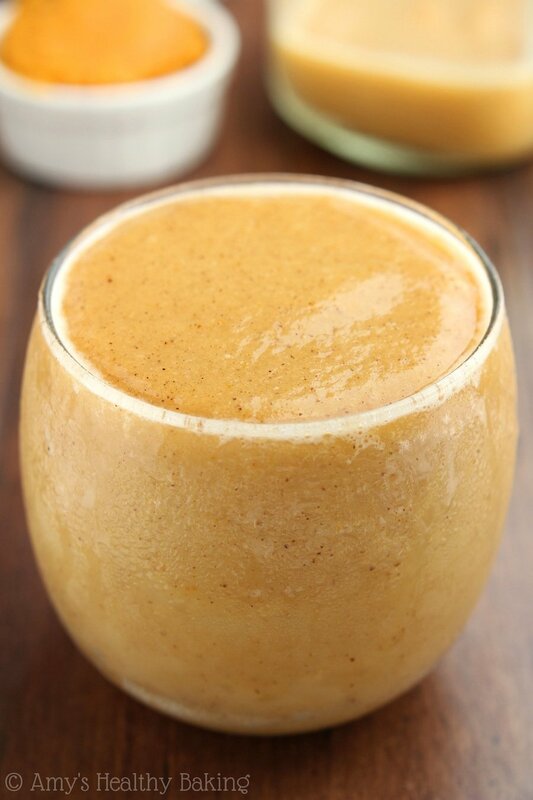 I’m so glad your mom’s homemade pumpkin purée made these smoothies turn out even better! 🙂 Thanks for taking the time to tell me, Kim! 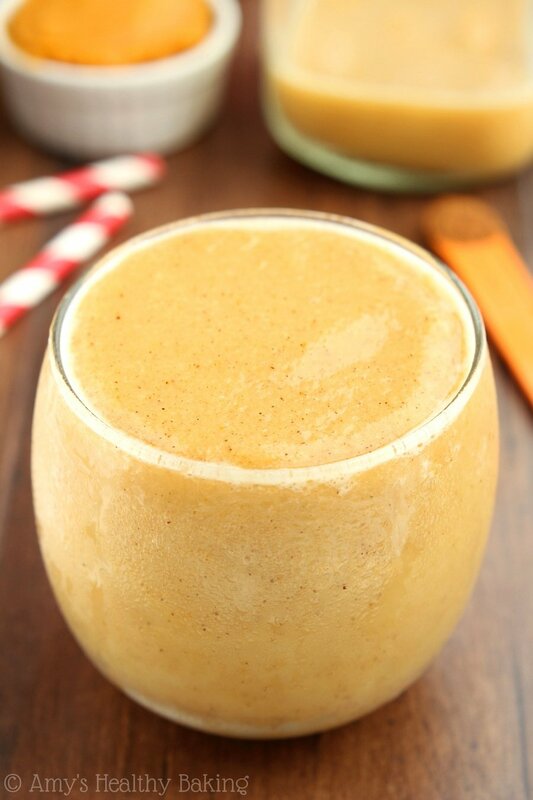 Hi,can eggnog be added to your pumpkin pie smoothie?mom just bought a carton of eggnog and I was just wondering if it would taste really good or aweful in your smoothie.have you ever tried putting eggnog in your pumpkin pie smoothie? Amy hi,mom and I just made your pumpkin pie smoothie for the seventh time today and as always it tasted really good,we loved and enjoyed drinking your smoothie. I’m truly honored that you made my smoothie yet again Kim! That means the world to me! 🙂 I’m so glad you and your mom are still enjoying it! Hi,mom and i made your pumpkin pie smoothie for the eighth time and we loved and enjoyed making it in the magic bullet blender one at a time,and i put 2 little scoops of chia seeds in my smoothie and it tasted really good like a pumpkin pie pudding and i am still full after i made it an hour ago.I ate my dinner then i made your smoothie.mom tasted my pumpkin pie smoothie chia seed pudding and she liked it as well. Thank you! I loved it! It’s my first time using my New Ninja system I received for Christmas! It was a bit thick but so yummy! I am doing weight watchers and your smoothie is only 3 points when I put it into the points calculator! I’m so glad you loved it Lucy! Thanks for taking the time to let me know! 🙂 I absolutely love my Ninja too. What a wonderful Christmas gift!